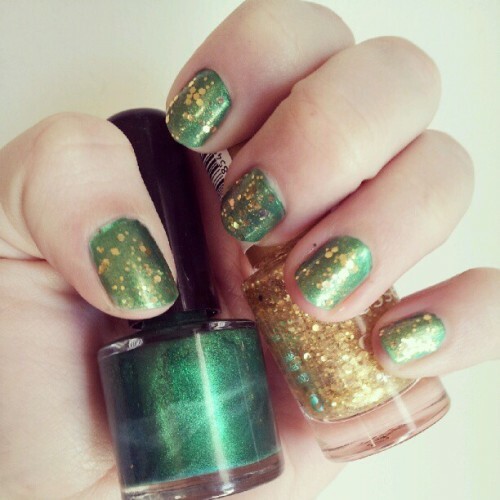 Whimsy Is Forever: On my nails: Supporting the Green-and-Gold! For the rugby on Saturday (well done Bokke! ), I decided to take my green-and-gold outfit to the girly level by adding a patriotic manicure! This metallic green polish is just a cheapie that I picked up from a campus vendor a year or so ago. After 3 coats, I slicked on 2 coats of this fun gold glitter polish from Essence. I love how the glitter has two particle sizes, plus has a subtle golden sheen.